Starring Buddy Ebsen, Irene Ryan, Donna Douglas, Harriet MacGibbon, Max Baer, Jr.
Jed Clampett (Ebsen) lived in the woods of Arkansas, a widower with a beautiful daughter named Elly (Douglas). One day, he was out hunting and missed his intended target. What he got instead was a very large oil strike. His relatives told him that with all the money he'll get he should pack up the truck and move to Beverly...Hills that is (sorry...I couldn't resist, I'm weak). Well, you know all the storylines...after all, the show ran for nine years. Granny (Ryan) is trying to get Elly married to any guy she meets while Jed continues to deal with the difficulties of raising a beautiful daughter on his own. Jethro (Baer) is just dumb as a brick, so he's got his own issues. 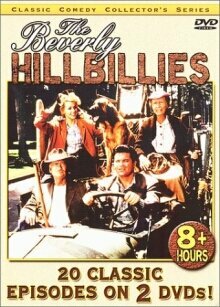 The rest of Beverly Hills is dealing with the culture shock of the hillbilly invasion. It's a really clever idea for the plotline of a sitcom and the cast played it beautifully. Ebsen and Ryan are outstanding as Jed and Granny, and it's obvious that the series would not have worked without their chemistry on screen. Douglas was there just to be the beautiful daughter and Baer was there just be the stupid redneck, but they each had their moments that have gone down in sitcom history. The DVD presentation in question has issues, however. Let's just get the obvious out of the way: in the way of special features, the only things you get are really odd cast bios. On both discs (both sides none the less) all you get is a Buddy Ebsen bio that scrolls by almost too fast to be read without slowing the speed down on your player. Also, the music is not bluegrass, as you might expect, but rather a somber tone violin piece. Really weird. That's all that can be said about the special features, but there's one other thing that bears mentioning. The universally recognized theme song by Lester Flatt and Earl Scruggs is missing almost completely. The only place that you hear it is in the incidental music during the show, but that's only because it was impossible to edit out. For the opening credits, rather than hearing that deep southern voice sing "Come and listen to a story 'bout a man named Jed..." you get some other instrumental piece of bluegrass music. 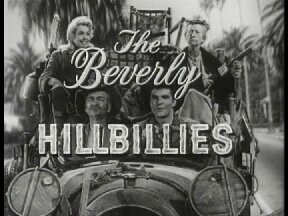 Don't get me wrong, the music by itself is great, but if I get a DVD of the Beverly Hillbillies, I expect to have special features about the original theme song that became the hit that it was. I'm sure that it has to do with licensing agreements and whatnot, but they should have waited to put this out until they could put the original theme song in its correct place. It really put a damper on watching these shows. This show is too much a piece of Americana to be treated like this with a DVD presentation. I say wait for a better set to come out even before you rent it. Buy The Fortieth Anniversary Wing Ding from Amazon! 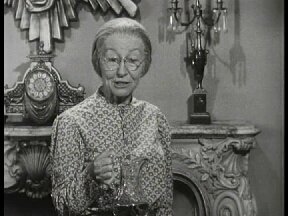 Buy Granny's Beverly Hillbillies Cookbook from Amazon! Buy the soundtrack from Amazon!